Gordon Bombay (Emilio Estevez) is a mess. Recently off the wagon, divorced and disbarred from practicing law at his successful law firm due to questionable ethics, Bombay finds himself at his lowest point when he’s convicted of drunkenly groping his under-age niece at a family reunion. The judge gives the former Mighty Ducks coach a choice: Go to jail for 3 years or pay his niece $80,000 in punitive damages. Having squandered all his money on hockey gambling, Gordon can’t possibly afford the settlement. To make matters worse, the former coach of the Iceland hockey team that Bombay and the Ducks beat in the Jr. Goodwill Games, Wolf “The Dentist” Stansson (Carsten Norgaard), now resides in the jail Gordon will be sent to should he fail to pay. Stansson blames his team’s loss in the Jr. Goodwill Games for starting the downward spiral that led to him winding up in jail and he has a whole gang of fellow Icelandic countrymen ready to break Bombay’s legs as payback. A month before he’s due to report to jail, Bombay wakes up at dawn on a park bench, with an empty bottle of schnapps resting nearby on the ground. A truck drives by and blows a flyer smack into Gordon’s face. Pulling the flyer off himself, Gordon reads it and discovers that there’s a regional Men’s Recreational Hockey League tournament happening in 2 weeks. The champions crowned at the end of the tournament win $100,000. So Bombay sets off to round up the old gang. But that’s not going to be as easy as it seems. Charlie Conway (Joshua Jackson) is a passionless lawyer who recently lost the love of his life because he was too morose and depressed to appreciate her. He’s also now estranged from his only son, Gordy. His priorities are all wrong. Adam Banks (Vincent Larusso) was a top Lieutenant of Bernie Madoff. After his boss went to jail, Banks ended up broke, bitter and angry at the world. Greg Goldberg (Shaun Weiss) is a smart-mouth pawnshop owner who haggles with his customers over pennies. He recently was diagnosed with adult onset diabetes. The Bash Brothers Fulton Reed (Elden Hensen) and Dean Portman-Reed (Aaron Lohr) discovered in college that they were actually gay for each other. They now live together and raise an adopted young girl from china who loves figure skating. When we see them now, the Bash Brothers wear rainbow gay-pride bandanas instead of their old black and white ones. Jesse (Brandon Quintin Adams) Hall is a civil rights activist who thinks President Obama is too conservative. He says hockey is a child’s game and has no time for it. Russ Tyler (Kenan Thompson) is an unhappy factory worker who lives at home with his hilariously loud and sassy wife (Kenan Thompson in drag) and their 9 rambunctious kids. Luis Mendoza (Mike Vitar) is a manager at Applebee’s where the local teens disrespect him and make fun of his bushy mustache. Connie Moreau (Marguerite Moreau) was the first female to try out for an NFL team (in a flashback we see her break through the o-line, run the ball 80 yards, only to get DEMOLISHED by Ray Lewis (cameo) at the goal line) who has since given up on all her athletic dreams. Ken Wu (Justin Wong) is an accountant who gets treated badly by his overbearing boss. Wu badly needs to find a backbone. 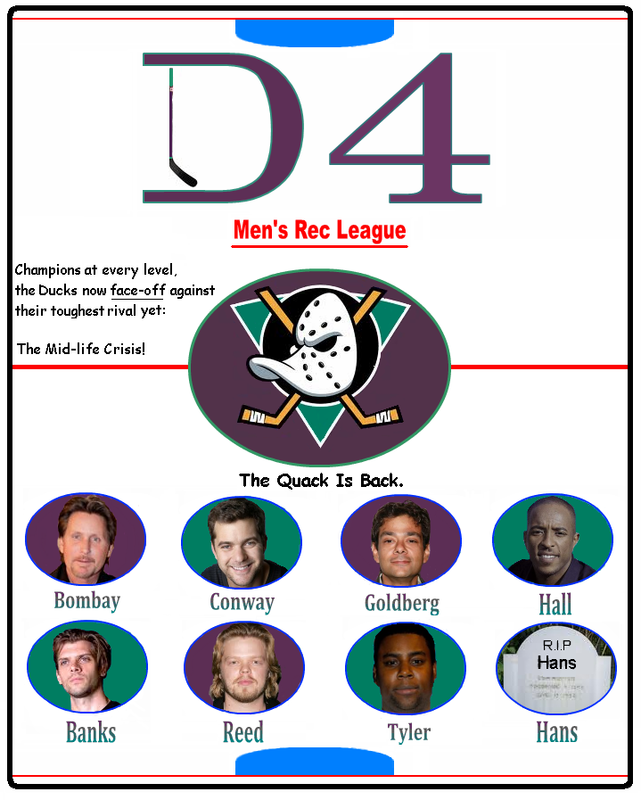 And so Gordon Bombay must bring the Ducks together to not only win a championship, but perhaps fill a hole in each of his players’ lives. And for Bombay, who initially brings everyone together for selfish and devious reasons, a long-needed lesson about the importance of teamwork, family, and – most importantly – FUN, may be coming as fast as a famous Russ Tyler Knuckle-puck! you bookmarked to see new things in your site. I say Charlie Sheen should be the coach of the rival team of this one since it was a family reunion. Say Emilio groped Charlie’s daughter or something, and that way it can all be wrapped around in one big circle? Sounds pretty interesting to me.